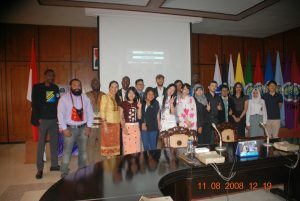 Office of International Affairs, Universitas Negeri Malang, organized culture sharing event for the first time under the title “UM International Culture Sharing 2016” which was held on April 26th 2016 at Ruang Sidang Senat (Senate Meeting Room), 2nd Floor of A3 Building, Universitas Negeri Malang. The event aimed at obtaining cross cultural understanding among Indonesian students and International students as well as Fellow International students. All staff of Office of International Affairs thanks so much to all International students and Indonesian students who were willing to attend the event. We wish you achieving the objectives altogether.